Hello again! I know, I don't blog for months and now TWO in two days?!?! And there'll be another tomorrow. Craziness! As those who follow me on Twitter or Facebook know, I got to a lot of concerts. A lot. While I didn't match the 40 I went to last year, I did manage 28 this year which isn't too shabby! BEST CONCERT: No contest, Sir Paul McCartney. He's a legend. He plays for nearly THREE HOURS and, you know, he was a Beatle. Do I really need to explain this? I even flew to Milwaukee to see him because he announced his New York date later and there was no way I was going to miss him. And next time he tours I might do the same. He's PAUL McCARTNEY!!! BEST NEW BAND: When I saw CHVRCHES the first time, they just had an EP out, but I was obsessed with their song "Recover." Then their album came out and it might be my favorite of the year. The second time was even more amazing, and I'm seeing them again in May. My favorite new band (closely tied with Walk Off the Earth whom I'm seeing next year as well)! BEST NEW TRADITION: Ingrid Michaelson's Holiday Hop. My concert bestie Chris and I saw Ingrid Michaelson's Holiday Hop last year and it was so much fun, we went again this year. Ingrid and her band open the show dressed up as older people and do funny versions of Christmas carols, then she had another opener, then they come out and do a full concert. It was one of the concerts I was looking forward to the most and can't wait to go back again next year (plus, Ingrid has a new album out so I'll probably see her twice next year). MOST TOUCHING MOMENT: Besides the ENTIRE Sir Paul concert, I have to say I was really moved when I saw Ed Sheeran play his first night at Madison Square Garden. I always love seeing people when they play the Garden the first time because it's such an iconic moment in their career. Ed got really choked up when he got on stage for the first time. Nothing like seeing someone's dream come true! There are so many more moments from this past year, but I've got to get ready to for New Year's Eve (and I've got one more book to finish reading so I'll be reading for tomorrow's post!!). Hope you all have a fabulous night this evening and that 2014 will be the most magical (and musical) year yet! Hi everybody! Hope you had a fabulous holiday, whatever you celebrate! I returned from ten days in Wisconsin and think I'm still in a food coma (so much cheese....). It wasn't until sweet Britta reminded me that I realized that I hadn't posted my holiday card this year. Not to brag, but last year's was pretty epic, so I knew there was no way to top it (click here to see past years). So I decided to not even bother. Luckily, I got to travel to some sweet places this year so was able to make a (lame) joke about being too busy. But then again, I'm in the middle of working on TWO different books projects (the already announced sequel to The Lonely Hearts Club and a secret project). Also, yesterday's INSANE Packers game and my flight home made me forget that yesterday was The Lonely Hearts Club's FOURTH anniversary! Can't believe I've been a published author for four years. Thank YOU for making my dreams come true. Hope everybody has a WONDERFUL 2014! There's so much I loved about INK IS THICKER THAN WATER: the characters, the humor, the cute boys (obvi), and THE APPLE. While reading Amy's fab book, I actually got up and went to my computer to Google this movie that she puts in the book because I thought it was fictional. But it was not. And now I'm obsessed with it, but refuse to actually watch it until I can do so with Amy. So while I look-up flights to LA, Amy is going to introduce you to possibly the best worst movie ever. Thanks so much to Elizabeth for having me on her blog! Elizabeth and I met at the L.A. Times Festival of Books earlier this year, where we quickly determined we were basically the same person, particularly our passionate feelings about karaoke. I included lots of things I love in Ink Is Thicker than Water, like restaurants I love in my hometown of St. Louis, mid-1960s music (especially The Hollies' "Bus Stop"), and tattoos, but none of these can really compete with The Apple. 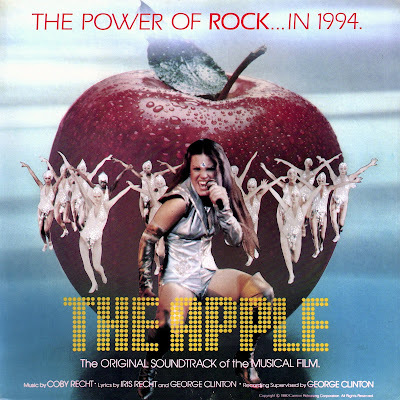 The Apple is a movie musical from 1980, but that makes it sound straightforward and normal, and, seriously? Nothing about The Apple is normal or straightforward. I'm a huge fan of musicals and of bad movies (if you haven't seen Nic Cage's The Wicker Man, you're only hurting yourself) and yet I'd never even heard of The Apple, until several years ago. A roommate arrived back from a showing at The New Beverly theater, all but unable to describe what she'd seen. She best described it as "a disco rock musical about the dangers of disco rock set in the futuristic world of...1994". She bought the DVD and forced the entire household to watch it. And I'm so, so glad I did. The Apple is the story of Alphie and Bibi, two "naive" ("naive" always means "stupid" in summaries, doesn't it?) kids from Moose Jaw, Canada, who just want to be successful singers. When they cause competition for the evil music executive-slash-metaphorical-or-literal devil Mr. Boogalow, he recruits them into his "dark" "underworld", and eventually Boogalow takes over the...world?...with his government mandated music breaks. Thank god for a clever group of hippies and their leader, who arrives with one of my favorite deus ex machinas ever. EVER. Well, this sounds bad, right? Maybe REALLY BAD? But the thing about The Apple isn't just that it's bad. It's so magnificently, mind-blowingly awful that it circles back around to being awesome. Every moment is either entertaining or hilariously confusing, and I must admit that I...I kind of love it. Nathan Rabin over at the AV Club said, "The peculiar genius of The Apple is that every time it appears that the film cannot get any crazier, it ratchets up the weirdness to almost indescribable levels." Take the title song, which features perhaps my favorite set of of lyrics in music history: "It's a natural, natural desire/Meet an actual, actual vampire." Here's a song which is a great example of how heavy-handed metaphors can seem. PS This little ditty about speed gets stuck in my head on a fairly regular basis. Seriously, despite how I'm compiling these clips to show you guys what an insanely terrible movie The Apple is, all I'm filled with is...a compelling desire to watch it again, and soon. Elizabeth, when are you coming over?? I'm on my way, Amy! Thanks so much to Amy for stopping by and please be sure to pick-up INK IS THICKER THAN WATER, you won't be disappointed. And visit Amy online at www.theamyspalding.com or on Twitter @theames - she gives good tweets! IT’S TRUE! THE LONELY HEARTS CLUB SEQUEL IS COMING! HOORAY! David Levithan at Scholastic has purchased North American rights to Elizabeth Eulberg's We Can Work It Out, a sequel to The Lonely Hearts Club. In addition, Eulberg will write three short stories about Penny Lane Bloom to be released online prior to the sequel, in which Penny Lane must balance her role as leader of The Lonely Hearts Club with having a boyfriend – with the added complications of her Beatles-obsessed parents trying to take over her sister's wedding and a run-in with the ex that broke her heart. Publication is planned for spring 2015; Rosemary Stimola at Stimola Literary Studio brokered the deal. For months I’ve had to bite my tongue and say things like, “Well hopefully someday I’ll write the sequel…” when in fact I’ve been working on it! Now I don’t have to hide this awesome news anymore. YAY! But I also know this announcement might raise some questions, so I’m going to do my best to answer them. Why do we have to wait until Spring 2015? That’s so far off! Yes, it is. But I’m still writing the book. I’ve been waiting years to be able to tell the continuing story of Penny Lane Bloom and her Lonely Hearts Club so I want to take my time writing the book that my wonderful readers deserve. Plus, you don’t have to wait that long for another book by me: Better Off Friends is coming February 25th! Three short stories? What does that mean? What will they be about? I’m writing three original short stories that will be published electronically FOR FREE prior to the release of We Can Work it Out. I can’t say much about the stories yet (since I haven’t written them! ), but will announce more details when I can. I live outside the US, when will I get to read We Can Work it Out and the short stories? Here’s the short answer: I don’t know. Here’s the long answer: I’m still writing the book. This is basically how foreign releases work: The author writes the book and works with her editor, then the book is shared with foreign publishers who decide if they want to publish the book and when it will be published. I’m really hoping the foreign publishers of The Lonely Hearts Club will want We Can Work it Out (and the short stories), but it isn’t up to me. As soon as I have information on foreign release dates, I’ll share it, but it won’t be for awhile as I’m still writing the book (do you see a theme here?). That’s all I can really say on THE LONELY HEARTS CLUB SEQUEL at this point. There’ll be much more information closer to the release date. I do want to thank all of you who have asked me about a sequel over the years. It’s been a dream of mine to write it, and I wouldn’t be able to do it without the support you’ve given me and Penny Lane these past few years. Thank you for wanting me to write more – I’ve got the best job in the world and it’s because of readers like you.